Here we have one of our newest designs for Disney's Epcot park. 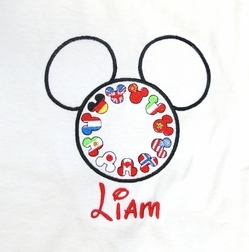 The world flags are so colorful and we just had to do an applique using them inside a mouse head of course! We drew what we wanted the design to look like and had it custom digitized just for this outfit! Every country in Epcot is represented here with a "flag head". You can purchase just the white cotton shirt OR you can purchase the shirt and shorts made from royal blue gingham. PLEASE NOTE: The expense of the shirt is due to the intricacy and number of stitches in the design. It is an original design and cannot be found in another store.